Different cabinet material types can help determine the aesthetic qualities and characteristics that a finished cabinet provides. With the variety available, designs and finishes can be tailor-made to suit the needs of any homeowner. Personal preference and price point will the ultimate deciding factor in the chosen finished product. This cabinet material is among the most popular for its unique colors. Characterized by the warmth the red hue of the wood provides a room, cherry wood will darken over time after extended exposure to light. The smooth grain in this material allows for easy finishing. 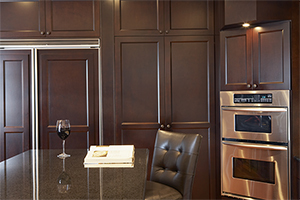 Maple wood is one of the most resilient materials available when searching for new cabinets. With its naturally creamy color, maple can be found in a variety of finishes. When observing maple wood cabinets, a unified graining is almost always apparent. Hickory too has distinct heartwood and sapwood differences. Natural contrasts within the wood have made it a staple within kitchen applications to add a sense of warmth and character. Mineral streaks and knots create a natural beauty that many homeowners admire. Oak can take on many different colors ranging from white to unique reddish hues. Most often oak wood is used in furniture construction because of its unique rustic look. This look is caused by mineral deposits within the wood that create color irregularities. Thermofoil is an economical cabinet material type that is formed by thermoforming a plastic material to a wooden core. This cabinet type often has problems when introduced to heat sources and moisture, making it unappealing in kitchen applications. For this reason, thermofoil faces certain limitations that other materials don’t. Glass can be found in a variety of applications other than cabinets. Most often glass inserts are used in cabinets to create a sense of openness. With the transparent qualities inherent in this material, any room these cabinets are placed in will gain a unique look. If you are in need of a remodeling contractor, Timco Construction is ready to turn your vision into a reality. Whether it’s a kitchen, bathroom or additional room, Timco Construction has the tools and experience to complete your remodeling job. Give us a call at 918-779-7330 for immediate service and pricing today!